Thurgarton – Paradise on earth? John Byng, fifth Viscount Torrington, toured extensively on horseback through England and Wales in the 1770-90s and published several volumes of diaries of his travels. 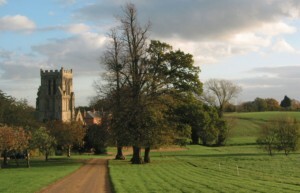 Old houses, churches, castles and ruins in general attracted him and on his visit to Thurgarton in 1789 he found the somewhat dilapidated church to his liking but he was highly critical of the adjoining mansion (built in 1777). In his journals he deplored the laxity of the Anglican clergy which he contrasted with the enthusiasm and spirit of the early Methodists. He bemoaned the loss of the ‘old church music’, of the church bands and choirs, and in each village and town he made this a particular point of enquiry. 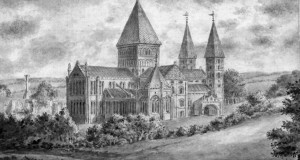 Sadly Thurgarton church confirmed his worst fears but at Southwell Minster, later that day at Evensong, he was astonished by the fine quality of the organ music and the choir’s singing. Below is an extract for Monday 8th June 1789 at the farthest point of the circular route he took from his lodgings at Newark on his horse Phoney. 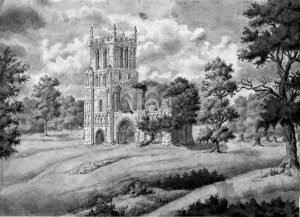 —My Pleasant Road brought me to the Village of Rowleston , thence to Fiskerton on the Rivers Bank—where were many Anglers employ’d in Chubb catching; and so by Notown, to Thurgarton, where I hoped to have found some Remains of The Priory of Benedictines. Passing thro’ the Village, I came to The very old Church, and seated myself, in much contemplation, and Quiet, for half an hour, in the Church Yard; till the Clerk arrived. About 15 years since Mr Cooper chose to build his new house upon the old Spot; taking infinite Trouble, as the Clerk told me, to overturn any remaining Ruins.—Now let me appeal to any man of Taste, if necessary, or to any Man of no Taste, by way of Remonstrance, and ask him whether these Ruins, being left, wou’d not have form’d great Beauties in his Grounds and Gardens? And whether a new House would not have look’d better in another Place than stuck close to the Church, without a Sight of the noble old Steeple? 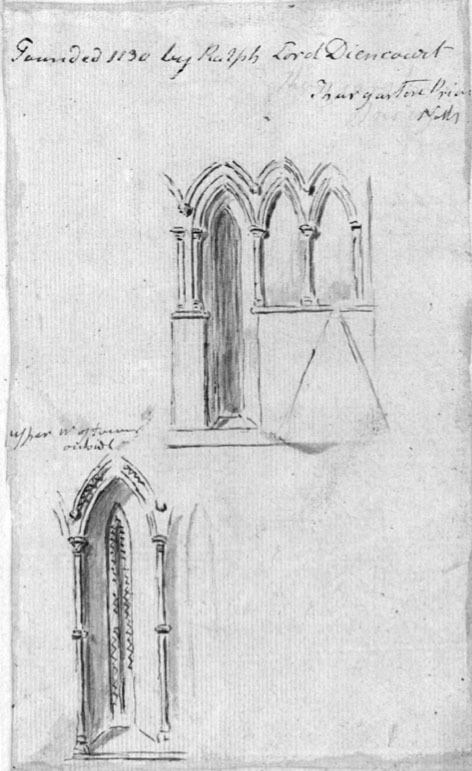 I had neither Pencil or Paper about me (like a Blockhead) or might have attempted something like a sketch of The Church; and written down a good Inscription abt. Loving and beloved Ruth, and Truth, etc.—This fine old Steeple must soon fall, for it is full of Cracks; but ‘Such Flaws are found in the most perfect Nature.’ It was but lately that a Love of Antiquity was pursued; For myself I am glad, tho’ the Priory was gone, to have seen The Steeple in good time; Shortly, Little of this kind will be left to see. Most of the Church has been pull’d down;—at the Eastern End was found, what The Clerk call’d a desolate Pavement, which was thrown away with the Rubbish; The inside is dark and damp, as the Church Yard Ground has risen considerably. In regard to the Decay of religious Duties, which every person can remark. 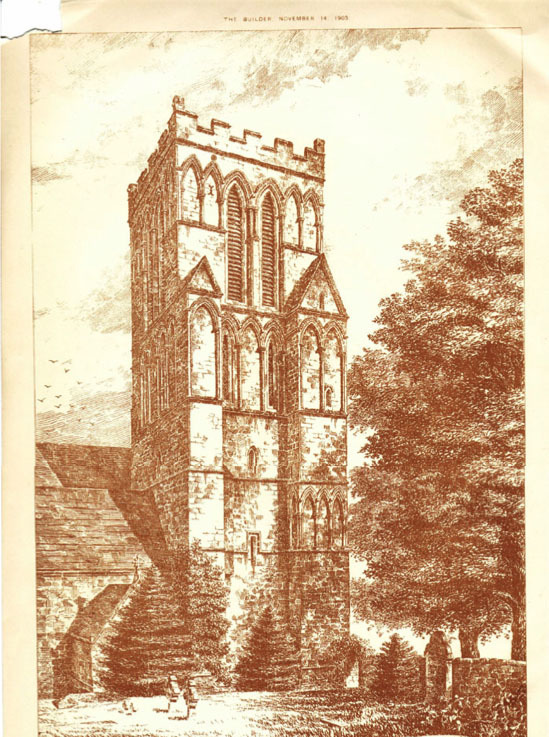 The Clerk said (to my regular Enquiry) that Singing had been disused about Six years.—At Botesford, yesterday I made the same enquiry, and found that tho the Psalmody there was on the decline, yet was it tolerably supported by 2 Bassoons, a Clarinet, and a german Flute.—Nothing shou’d be more encouraged as drawing both Young and Old to Church, than Church Melody, tho’ the Profligacy and Refinement of the age has abandon’d and ridiculed it: But were I a Squire of a country Village I wou’d offer such Premiums and Encouragement, (of little cost to myself) as wou’d quickly rear an ambitious, and laudable desire of Psalm-Singing, and put forth a little Chorus of Children; than which nothing is more Elevating and Grateful and Sublime, hearing Innocence exert their little Voices in praise of their Creator. For let Fashion say what it can. Every Ear is more gratified by a chorus of youth, than by the most violent Exertions of Taste. 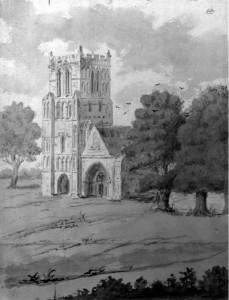 Unlike Viscount Torrington, the Reverend T D Powell remembered his sketchbook on his visit to Thurgarton in 1819, which is fortunate for his writing is difficult to decipher. The extract below is therefore heavily edited being limited to those passages that are both decipherable and make sense. His sketches vary from realistic architectural detail to imagined reconstructions (Southwell Minster) and to romanticised ruins in a landscape (Thurgarton church). 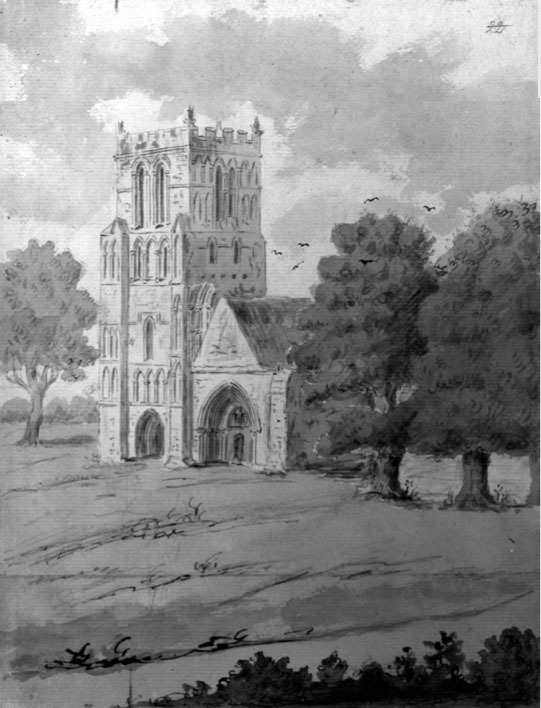 Rev Powell’s sketches are the only 19th century depictions we have of Thurgarton church before its restoration in 1854 – they show a church essentially unchanged from that in Samuel Buck’s print of 1726. Reverend T D Powell’s visit to Thurgarton in August 1819. 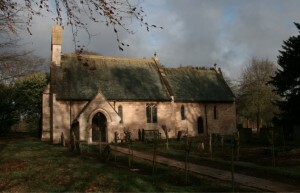 From Southwell SW ascended and at more than a mile came to Horton (Halloughton) a little church up a lane on the right of my road, did not go in, it has two lancet windows in the east front. On the gable at the west end is a modern cupola containing a bell. 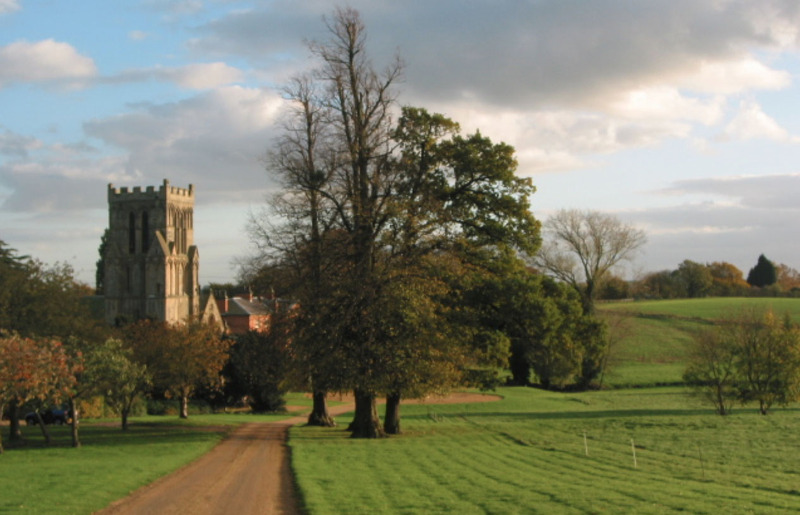 There seems some Gothic buildings nearby but had not time – from hence to Thurgarton whose noble tower painted with the fine tints of ages comes upon you with fine solemn, venerable and beautiful effect. This tower is the north –west tower and is at the west end of the nave of the abbey church with its front highly adorned with arches and windows in the lancet style of the first Gothic bordering on the Norman. The lower part of the west end is a noble spacious west portal in the same style highly adorned with deep receeding pillars and moulding. The modern red brick house or mansion of Col. Cooper stands a small distance south he says it was built by his father ( most probably on the site of the cloisters and habitation parts of the convent) who then pulled down the old buildings but that some of the vaults remain. He adds that from foundations lately dug there certainly were two towers at the west end as I and indeed everyone must think. What remains besides of the church is very small, the body of the nave running from the west entrance perhaps not a quarter of its length eastwards and the same portions of its side aisle divided with arches and pillars form the present church. What I have observed of the remains of these arches is sufficient to prove what a fine and spacious edifice this church must have been. Tis situated in a beautiful valley quite away and retired from the village – it must have been A Paradise On Earth. On a fine sunny evening standing outside the west end of the church one can echo such thoughts. 2 British Library BL 19915 . Rev. David Thomas Powell’s 19th c sketches and comments on churches in Nottinghamshire and Derbyshire.